All I can say is bravo! I tried many a different product over the years and found them to be confusing at best and frustrating at worst. This is the first time in all my years of playing that I'm starting to understand the modes. Why has no one thought of this before! - Another common comment from customers! This remarkable practice aid is not only useful for untangling the difficult subject of 'guitar modes' but is also an incredible shortcut to being able to play guitar along to most modern songs WITHOUT LEARNING ANY MUSIC THEORY OR COMPLICATED AND NUMEROUS SCALE SHAPES AND PATTERNS! Turn on the radio, pick up your Mode Decoder and start to play along - whatever level of guitarist you are - from complete beginner (or even non-guitar player) to advanced jazz player, the intuitive progressive leaning method in this simple device is always relevant to your playing. Forget learning every note on the fretboard. 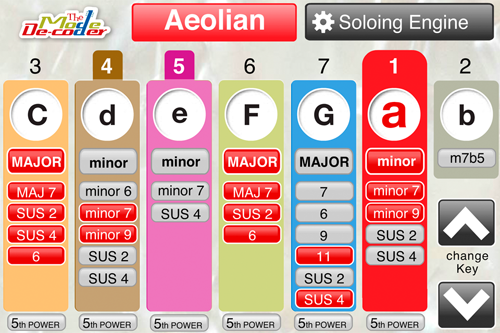 Use simple bar chords and easy minimal variations to play chords, compose and embellish your composing and playing. And now there's an app version for your Apple or Android device! 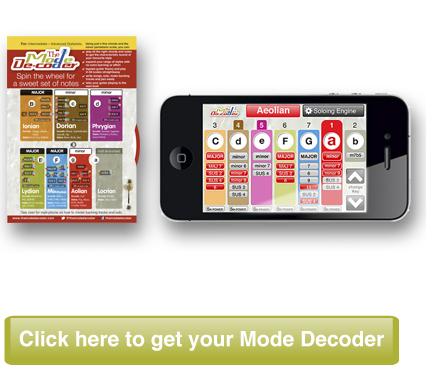 This contains all the same information as the card version plus audio samples of each chord. Amazon review - Finally a way to learn modes that makes sense! Email review by Alan from the Wirral. 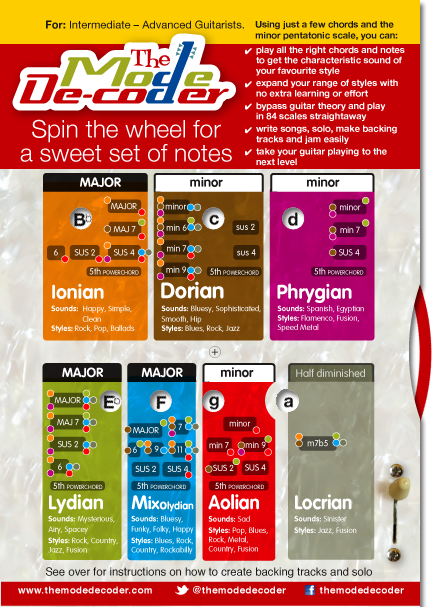 Amazon - A really useful guitar wheel for anyone who hates guitar theory! By F. J. Rodrigues "Gadgetmeister" on 5 August 2015 Once you work it out its really cool. By C P Currier on 9 October 2015 if you play guitar you need this. End of.